America has become the business place of choice for companies looking to capitalize on the natural gas boom, made possible by horizontal drilling and fracking. The massive natural gas supplies in the United States have lowered energy prices, and chemical manufacturing companies are taking advantage of a new found competitive advantage right here in Texas. Recently, Linde Group announced that it was bringing a major industrial investment back to the United States. The company revealed its plans for a $200 million expansion for its La Porte, Texas industrial complex earlier this week. Linde emphasized that the United States now has a “competitive edge” over its competitors in other parts of the globe. A similar story is playing out across the nation. Last year, Ohio businessmen began thinking of ways to capitalize on the shale gas boom. In Louisiana, the development of a new methane plant and a new ethane cracker brought 8,500 new jobs to the state. In Pennsylvania, nearly a quarter of a million jobs are tied to natural gas. Even the president has taken the time to recognize the vast amount of manufacturing jobs created by the U.S. shale industry. Natural gas is a feedstock for a wide variety of products, meaning there is a need for it in countless manufacturing plants around the country. 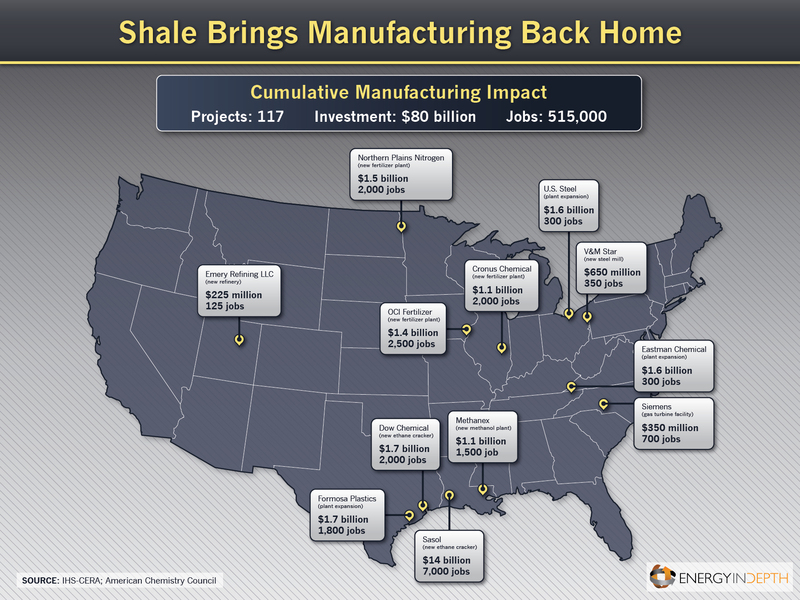 Manufacturers of products such as plastic and fertilizer are reaping the immense benefits of low-cost shale gas. EID recently reported on the $47 billion investment to the plastics industry that is expected to arrive over the next decade. Investments such as Linde’s create a ripple effect in local economies. There are services and products needed for each phase of natural gas processing, and this means more jobs and tax dollars for local communities. The companies who produce the industrial products necessary for handling natural gas are also benefiting from the investments brought in by the shale gas boom. According to a PWC report released late last year.